The Jersey Shore Boca men’s under-23 and under-20 teams concluded their summer soccer season last weekend in the Mid-Atlantic Summer Showcase League (MSSL) as both teams participated in the MSSL Cup Championships at the Piscataway Soccer Complex with the Boca U20s advancing to the final-four round Sunday morning before loosing to the Iron Lakes Sports Club from Allentown PA.
TOMS RIVER, NJ (August 2, 2005) – The Jersey Shore Boca men’s under-23 and under-20 teams concluded their summer soccer season last weekend in the Mid-Atlantic Summer Showcase League (MSSL) as both teams participated in the MSSL Cup Championships at the Piscataway Soccer Complex with the Boca U20s advancing to the final-four round Sunday morning before loosing 3-1 to the Iron Lakes Sports Club from Allentown PA. In Saturday’s MSSL Cup preliminary round action, the Boca U20s started the day with a tough 3-1 loss to the Silver Lake Rams from Staten Island. Boca’s Justin McGrath (Brick) converted a penalty-kick mid-way through the second half to bring Boca within one goal at 2-1 before Silver Lake scored their final goal in the last few minutes of the game. In their second game of the day, the Boca U20s upset the powerful Connecticut Strikers 2-0 on two goals by Brookdale Community College standout Nick Klah (Eatontown). In the fifteenth minute of the first half, the former Jersey Blue mid-fielder received a cross from Syracuse University bound Andrew Hawtin (Toms River) on the left side about 30 yards out and ripped a upper 90 shot that left the CT keeper standing still. Klah, who will attempt to gain a walk-on spot at Monmouth University in September, scored again mid-way through the second half when Seton Hall’s McGrath split two defenders with a perfect ball and found Klah all alone inside the box who placed the ball into the far post netting allowing the Boca U20s to advance to the Cup semi-finals. The Boca U23s lost to the Iron Lakes Sports Club 2-1 in Saturday’s initial MSSL Cup round game with Jason Mancuso (Toms River) scoring for Boca assisted by Justin Fuccello (Brick) and battled Milmay FC from South Jersey to a scoreless 0-0 draw in their second game of the day. In Sunday’s semi-final MSSL Cup game, the Boca U20s, who played without several key starters due to injuries and personal commitments, gave up three unanswered goals to Iron Lakes in the first half. Boca scored their lone goal mid-way through the second half as the Central Connecticut State bound Mancuso found the back of the net from a cross by Mark Schmiegel (Toms River) which ended the game at 3-1 in favor of Iron Lakes. “Regardless of the wins and losses, I believe this has to be one of the most successful summer programs in our Club’s history” mentioned Walt Konopka, a member of the Jersey Shore Boca Board of Directors who also ran the men’s summer program. “Our U23 and U20 teams played forty-three total games since March and had forty-five overall participants on their combined rosters. We gave our players a fantastic summer environment to maintain and improve their play and get ready for the fall college soccer season in a highly competitive setting” Konopka added. The Boca U20s finished the summer with an overall record of 10-10-3 which included seven exhibition games, ten MSSL league games, three MSSL Cup games including advancing to the semi-finals and three games in the United States Adult Soccer Association’s Regional Championship Tournament in which the U20s also advanced to the semi-final round. The Boca U23s also played seven exhibition games, eleven MSSL league games and two MSSL Cup games and finished the summer with a record of 6-9-5. 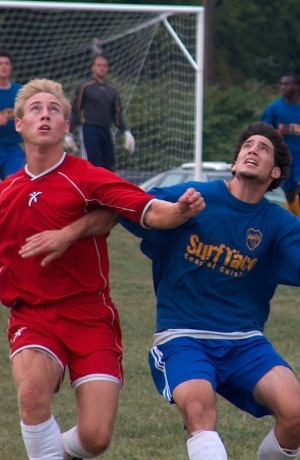 The Mid-Atlantic Summer Showcase League is a second year regional soccer league fostering high-level competition during the summer months at both the youth and adult ages in both men’s and women’s divisions. The adult level of MSSL is specifically designed for collegiate players under the age of twenty-three and is fully sanctioned by the United States Adult Soccer Association, the national governing body for adult amateur soccer. Jersey Shore Boca was one of the inaugural founding members of MSSL last year entering one U23 team. The 2005 MSSL summer season began on June 4th and will finished on July 31st with the league playoffs and MSSL Cup Championship. The Jersey Shore Boca men’s summer soccer program was officially sponsored by Surf Taco, a popular Mexican themed restaurant chain based in Point Pleasant Beach.